Using a hands-on approach, this text provides students with the needed skills in human relations that are becoming increasingly important for career success. 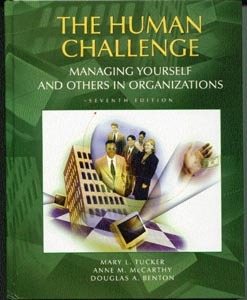 It emphasizes the person in the organization and the interactions between managers and other employees. Students will like this text for its conversational style while instructors will appreciate the experiential exercises that reinforce course theory for student-centered learning. Action projects in each chapter - Gives students the opportunity to practice the techniques they just learned.